Tennant Creek  is a town in the Northern Territory of Australia. It has a population of around 3,500. It is known as the Territory’s heart of gold mainly due to the people, but also in reference to the gold mining history. Tennant Creek in Central Australia sits on the Explorer’s Way, 500km north of Alice Springs and 1000km south of Darwin. The town is surrounded to the east by the Barkly Tablelands - a huge expanse of land that supports some of Australia’s premier outback cattle stations. Tennant Creek sits in the middle of the outback, but the country is beautiful and anything but barren. The town is situated in open mallee scrubland, surrounded by rocky ranges and brilliant blue skies that give way to millions of stars at night. Aboriginal culture is strong in Tennant Creek. 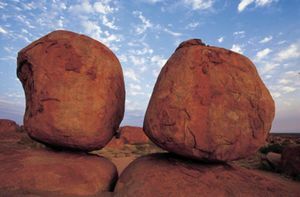 The traditional land owners of this area are the aboriginal Warumungu people, and they recognise a number of sacred sites in the area, including the region’s most famous landmark – the Devils Marbles – about 100km south of the town. They believe that these are the eggs of the Rainbow Serpent – a creature of a Dreamtime story. The Nyinkka Nyunyu Culture Centre in Tennant Creek is an award-winning aboriginal attraction that showcases the people’s stories and art. The Barkly region is steeped in the ancient traditions and beliefs of its traditional custodians, and around nine Aboriginal groups call the area home, including the Warumungu, Walpiri, Kaiditch and Alyawarr people. The Barkly region is also renowned for the cattle industry and encompasses some of Australia's largest and most historic stations. These include Newcastle Waters, Banka Banka and Brunette Downs. The Overlander's Way tourism drive follows the paths of many droving heroes who brought vast herds of cattle through the Barkly on their way to the Queensland coast. The air is fresh and clean here and the colours of the landscape are ever-changing as the rocky hillsides pick up the varying sun's rays between daybreak and evening. This phenomenon is particularly evident at the Devils Marbles (Karlu Karlu to the Aboriginal people), a collection of huge granite boulders precariously balanced on top of one another, 100km south of the town, which glow fiery red as sunset hits. The Pebbles (known as Kunjarra) are another granite outcrop formation, just north of the town, and it's also a sacred site for the Warumungu people. Camping is popular way to experience the region. There are plenty of spots to pitch a tent or roll out a swag, but some of the best spots are dotted throughout conservation reserves in the Devils Marbles and the Davenport Range National Park - a 1120 square-kilometre area east of the highway about 250km south of Tennant Creek. The Park is dotted with waterholes that attract plenty of wildlife, birds and fish. A number of walking trails throughout the region allow travellers to experience the plants, birds and landscapes of Tennant Creek up close. One walking path winds its way through the Honeymoon Ranges to Lake Mary Ann, five kilometres north-east of the town, and the perfect spot for a swim and a picnic. Adventure lovers have plenty of options in the Tennant Creek area. Four-wheel-drivers in particular are spoilt for choice with the plethora of moderate to challenging tracks available to test their skills and their vehicles. The Davenport Range National Park is an excellent four-wheel-drive destination and there are plenty of nooks and crannies to explore. The Old Police Station Waterhole, located on the Frew River, is the park's best known attraction, and the moderately challenging Frew River Four Wheel Drive Loop Track is an exciting alternative route in. It's a rocky, 17-kilometre track with several kilometres along the ridgeline, which affords spectacular vistas. This is just one of the four-wheel-drive tracks in the region. Camping in Tennant Creek is an adventure in itself. There are caravan parks and camp grounds in town, but for a real feeling of isolation, where there are no creature comforts, pack up the car and try one of the region's bush camping sites in the peace and quiet of the outback - make sure you take all your own supplies. Why not aim to go home in style after you discover your fortune in Tennant Creek? There are a number of sites in this area where people can fossick for their own gold - and apparently there's still plenty here to be found. Another adventurous pursuit in this area is experiencing life on an outback cattle station. Travellers can camp at Banka Banka Station, an operating station 100km to the town's north. 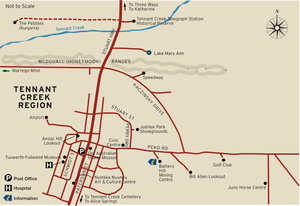 The only way to reach Tennant Creek is via Alice Springs, Darwin or Mt Isa in Queensland. A 4WD will come in handy, however, the main roads are sealed. Helicopter and small plane trips are a popular way to reach remote destinations and you get to take in the spectacular landscape. There are now flights on Tuesdays and Thursdays from Darwin to Tennant Creek with Vincent Aviation. Cars can be hired at Alice Springs or Darwin. It is possible to hire at one and drop off at the other for a fee, but probably best to check with the company beforehand. Tennant Creek is 500km north along the Stuart Highway from Alice Springs and 1000km due south from Darwin. Car rental companies in the Northern Territory have daily distance allowances after which a surcharge is payable, however, if you book with the government wholesaler, Territory Discoveries , you can get unlimited rates. Greyhound  services the highway between Adelaide and Darwin, with a stop in Alice Springs. Northbound the coach arrives in Tennant Creek at 2.10am, and departs at 3.25am. Southbound, its a similar time, with the coach arriving at 2.00am and departing at 3.20am. The Ghan , the train running on the famous Adelaide-Darwin route passes by Tennant Creek twice each way per week and will stop on request. Serious enthusiasm for train travel is required to book in advance, arrive at 2AM in the morning, and then catch the next onward train out at 2AM three or four days later. The Ghan, being a tourist train rather than a regular form of transport, also charges a significant premium to the bus, and takes considerably longer. The town itself is relatively small and everything within the town can be reached on foot. A car is needed to reach attractions slighly further afield. The Bill Allen Lookout offers a clear 360-degree view across the landscape and town - it's especially worthwhile to do this at sundown. The Davenport Range National Park offers some great four-wheel drive tracks. The Old Police Station Waterhole has an alternative access road via the 'Frew River Loop,' a demanding 17-kilometre track that should only be attempted by experienced four-wheel-drivers. Check road conditions with the Alekerenge (Ali Curung) police station on +618 8964 1959 before travelling. Cattle station stay Banka Banka Station, 100 kms north of Tennant Creek, operates as a campground, while still being part of an 11,600 square-km cattle station. Enjoy friendly service while having a cold beer on the verandah of the historic mud brick homestead. Bring a steak to cook on the barbecue and swap yarns around the campfire. There are several small shops including a supermarket in Tennant Creek mainly selling the essentials. There are several bars/pubs as well as a liquor store. The Eldorado Motor Inn  is comfortable, clean and feels relatively safe. Newcastle Waters Historic Township Located at the junction of three major overland stock routes, Newcastle Waters was an important gathering place for drovers to provision and rest before continuing on with their gruelling overland cattle drives. The township has become a ghost town, but while uninhabited, Newcastle Waters has a rich, vibrant history. Preserved historic buildings such as Jones's Store and the Junction Hotel are a reminder of the early pioneering era. The Drover's Memorial Park, featuring a bronze statue of a drover, is also a must see. Access is through Newcastle Waters Station. Please observe all station rules that apply. Barkly Tablelands The Barkly tablelands run east from Tennant Creek towards the Queensland border and are among the most important cattle grazing areas in the Northern Territory. Elliott, 255km north of Tennant Creek, is the Barkly region’s second largest town and was developed during World War II. There is a range of services and facilities available for the traveller. Lake Woods nearby is a large body of permanent water in an otherwise largely arid region and is a haven for many bird species. Banka Banka Located 100km north of Tennant Creek, the Banka Banka Station was the first operational pastoral lease in the Barkly region. There are grassed camping grounds with modern facilities. During the tourist season visitors can experience a slide show talk on outback station life. Daly Waters is a crossroads of outback history. Established to service cattle droving routes, this small township was also incorporated into the Overland Telegraph Line, served as a stopover for early Qantas flights to and from London, and was a major staging post for troop and supply movements during World War II. The Daly Waters Pub is the quintessential outback watering hole and the epicentre of the township. It is a worthwhile diversion from the drive, famous for its bush hospitality, huge meals and quirky decorations on the walls. Renner Springs, now a roadhouse and motel, was originally a medical post for the workers constructing the Overland Telegraph Line in the 1870s. Its name derives from Doctor Charles Renner, who was the physician there, and the fact that there are numerous springs in the area. Attack Creek 74km north of Tennant Creek is a monument marking the point where explorer John McDouall Stuart turned back on his expedition to cross the continent in 1860 after a hostile encounter with some local Aboriginal people. It has since been appropriately known as Attack Creek. Barrow Creek, 204km south of Tennant Creek, was established in 1871 as a repeater station for the Overland Telegraph Line. The original stone buildings were complemented by a store and pub in 1932, coinciding with the gold rush in the area. It is now a popular stopover between Tennant Creek and Alice Springs. Davenport Range National Park is an area of rugged outback beauty that can be accessed off the Explorer’s Way, 87km south of Tennant Creek. The Old Police Station Waterhole is picturesque and camping is allowed here. A high-clearance four-wheel-drive is necessary to fully experience the Park. Wycliffe Well Holiday Park is located 132km south of Tennant Creek. Facilities for travellers include caravan, camping and cabin accommodation, a shop and a service station. Its main claim to fame, however, is numerous UFO sightings that have been reported in the area, alluded to by the concrete aliens out the front. This page was last edited on 23 February 2014, at 06:41.